Breakfast burritos are a uniquely American invention, a bastardization of an iconic Mexican dish (actually invented in California) which takes the contents of your typical breakfast plate — eggs, carbs and protein — and neatly packages them into a tube. It’s convenient enough for on-the-go eating yet decadent enough to get you through a hungover Sunday morning. 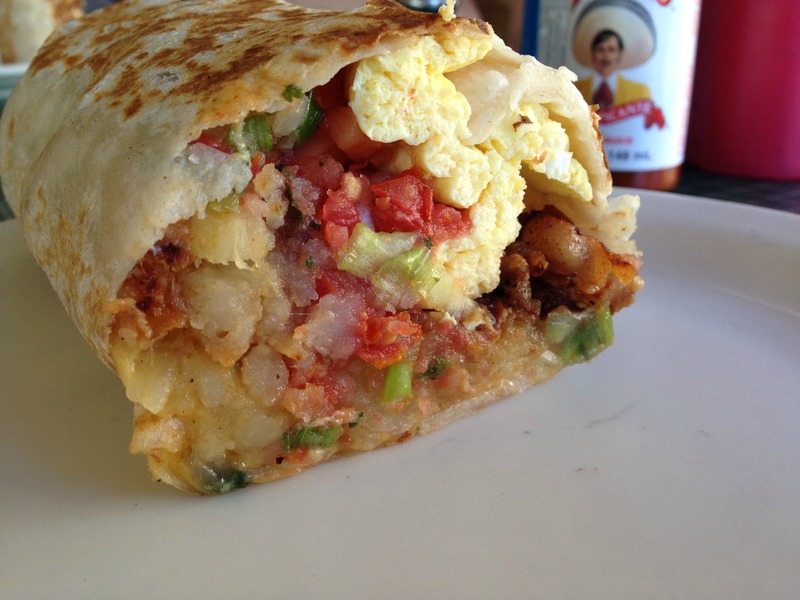 The Bay Area has variations of every type of breakfast burrito, from the usual scrambled egg and home fries combination to ones closer to actual burritos. There are even multiple spots for vegan breakfast burritos. 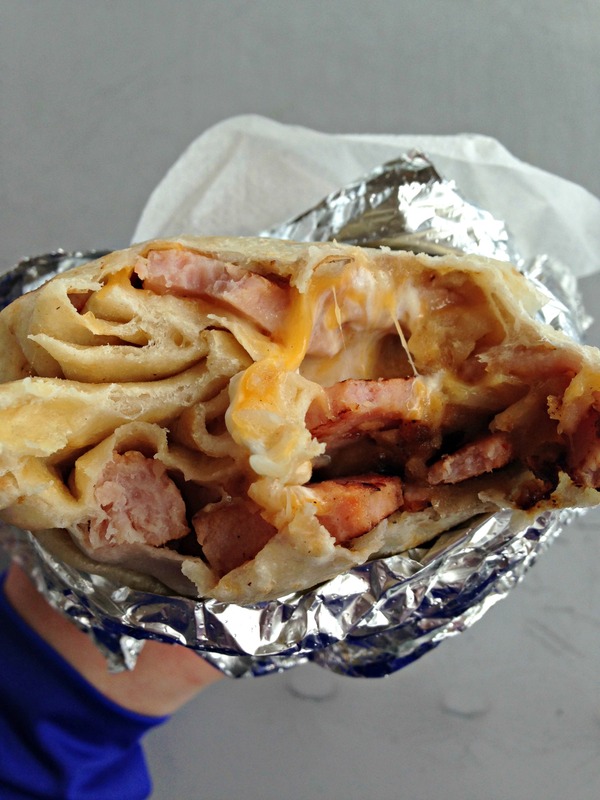 In the East Bay, there are plenty of options for breakfast burritos, ranging from traditional to a French-inspired. Did we miss your favorite? Let us know in the comments! The menu at Otaez — with locations in Oakland’s Fruitvale district and Alameda--offers two breakfast burrito options. 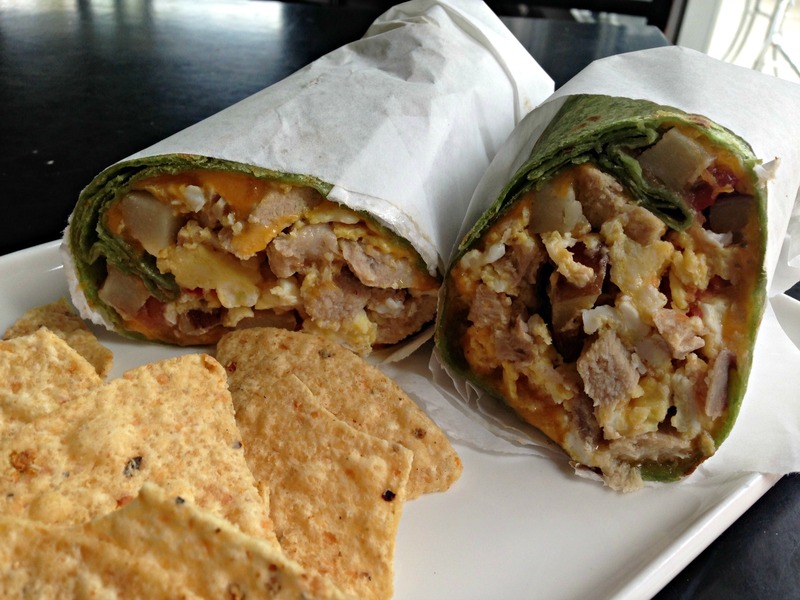 They offer a breakfast burrito, stuffed with the traditional scrambled eggs, cheese and potatoes, with the option to add sausage, bacon, ham or spinach. Then there’s the Burrito de Desayuno. The difference in names indicates whether you want a typical American-style breakfast burrito, or one that more resembles an actual burrito. 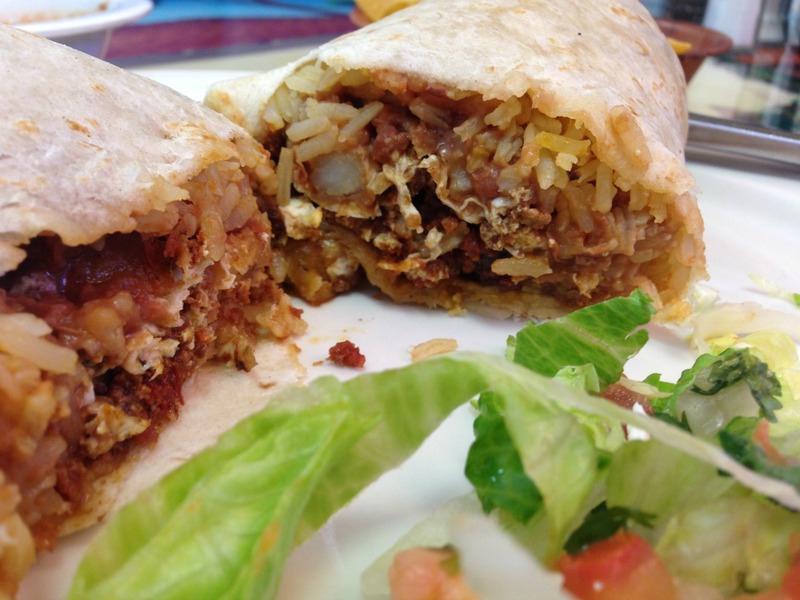 Ordering the Burrito de Desayuno gets you a burrito filled with rice and beans, and allows you a more interesting range of filling options: chorizo and potatoes, machaca, or huevos con nopales (eggs with cactus). (It should also be noted that both burritos are under $6, a great bargain). The chorizo and potato burrito was massive, packed with salty chunks of spicy chorizo, tender potatoes and bits of fried egg. Flavorful beans and rice added bulk, ensuring that you’ll stay contentedly full until lunch--or even dinner. Tribu, located where Emeryville, Oakland and Berkeley all intersect, is one of those stalwart cafes that serves a dizzying amount of functions. There are green smoothies. There are board games and wraps. There is beer and tequila. While I was there, the crowd ranged from office workers to friends catching up on gossip (Overheard: “Is the father still in the picture?”) to my college landlord (drinking orange juice, looking spry). Their breakfast burrito comes wrapped in a spinach tortilla, and is carefully assembled to highlight individual ingredients. While some breakfast burritos are homogenous masses of meatcarbscheese, this one featured defined chunks of red potatoes, eggs and well-seasoned pork. Homemade mild salsa added welcome heat and contrast. What were you doing on November 15, 2007? If you happened to be in Berkeley, you were unknowingly celebrating Original Pollo’s Restaurant Day, so decreed by then-and-current Mayor Bates in honor of the restaurant's 20-plus years of serving Downtown Berkeley humble, chicken-centric fare with a smile. The decor is pleasantly cluttered (There’s one of those inspiring kitten posters on the wall), the service gently paternal. And the breakfast burrito? Large, crispy and no-frills, a spicy mix of blackened onions, scrambled eggs, hash brown-style potatoes and a ton of crispy bacon. Pico de gallo added added freshness, and homemade salsa provided more heat. A good way to start your day, whether you’re a Cal student stumbling down from the dorms, or merely grabbing food before getting on Bart. The presence of a breakfast burrito on the Berkeley Gregoire menu is a testament to both globalization and the dish’s malleability. A French-ish riff on a breakfast burrito? Pourquoi pas! While there are standard touches--large slices of avocado, melted cheddar, pico de gallo — It diverts from tradition in several ways. It comes on grilled lavash instead of a tortilla. Instead of scrambled eggs, the eggs are gently fried and runny. 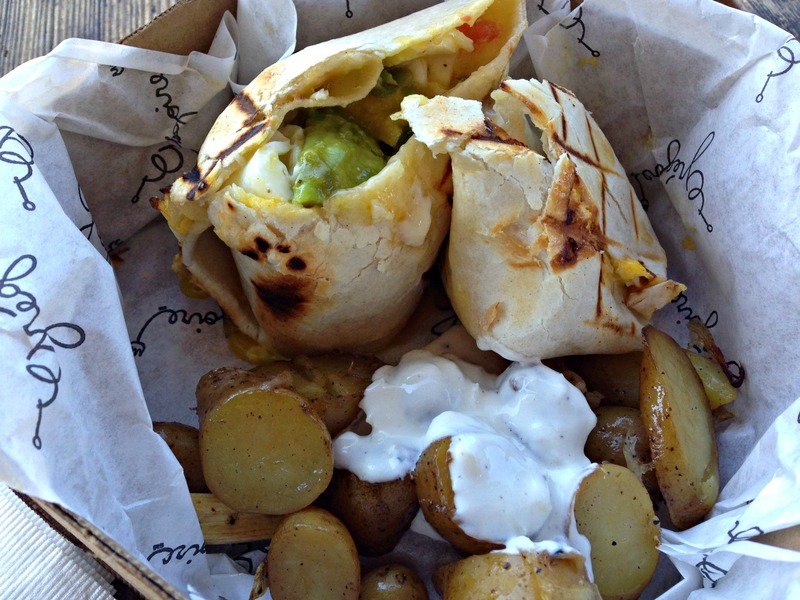 There are no potatoes in the burrito. Instead, there’s a side dish of roasted fingerlings, which come with a delicate shallot cream. It’s drippy and delicious, but frustrating to eat: there’s not a lot of structural integrity, forcing you to eat as fast as you can before it falls apart. But the ignominy of eating it is worth it: for one, it’s delicious. And how often do you get to eat Mexican/French/American fusion? In case you doubted that great breakfast burritos can be found everywhere in the East Bay, look no further than the improbably delicious burrito at Emeryville’s Home Depot. Yes, Home Depot, that gigantic orange testament to do it yourself-ness. No, not actually in the store. Outside of the entrance you’ll find Kelly’s Deli, a tiny food stand producing a Mexican-ish menu of breakfast and lunch items like breakfast tacos and Philly Cheese Steaks. This is fatty, decadent food meant to sustain people for a long day of physical labor, to be scarfed down at the handful of outdoor picnic tables before grouting or gardening. A ham breakfast burrito was considerably better than it had to be, with huge chunks of seared ham, rivers of sour cream and piles of seasoned potato. It’s all covered with a massive amount of cheese, producing a decadent mess of a burrito that’s pleasantly spicy (a nearby squeeze bottle of Tapatio adds more heat if desired). Since it comes pre-wrapped, it’s an ideal grab and go meal, whether you’re installing new floors or merely trying to make your coworkers jealous.